So in about 5-6 weeks’ time, the grass is dying. I have not yet planted anything in the beds yet but if I wanted, I would just poke a hole through the newspaper and dig out the dead grass (which is easy to remove since it is dying) and plant a plant in it. Of course, you’ll need to do some consistent “grass weeding” until all the grass is dead and none is invading the area. To help with the grass invasion, we will be edging the bed with a sort of trench in the coming weeks. I’ll show some pictures of that soon. 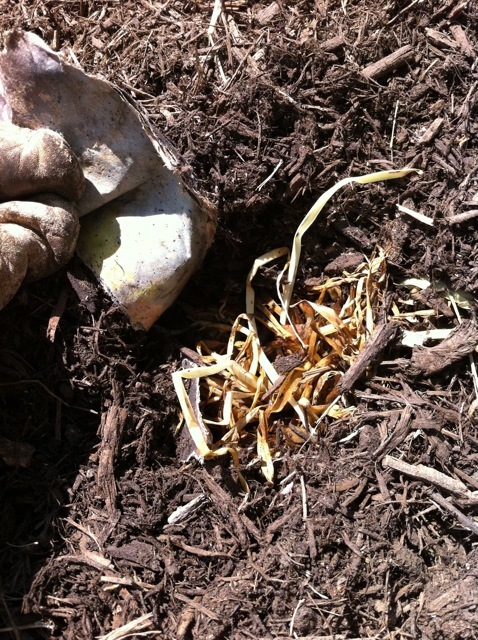 One issue with this method is that it does not allow you to amend your soil. If you dig out all all the grass, you could amend the soil from the beginning. But digging is so difficult with established grass. If I wanted to amend the soil, I think I might kill the grass with the newspaper method by doing this method above. When I saw the grass was pretty much dead, I’d remove the mulch (use it in another area or put it on a tarp for use again). Then you could dig out the dead grass which is much easier to remove, amend the soil with lots of compost and other good things, plant your plants, and then put some of the mulch back on top!